Home > Resources > Smart Products > Kitchen Filler Panels – Do I really need them? Kitchen Filler Panels – Do I really need them? So do I need Kitchen Filler Panels in my design? Here at Semble we see thousands of saved kitchen designs from all over the country. Everything from professionally drawn architectural plans through to quick sketches on the ubiquitous post-it note! It doesn’t matter how they were drawn or who designed them, they often share the same design flaws. The finer detail of good kitchen design can at first feel overwhelming. 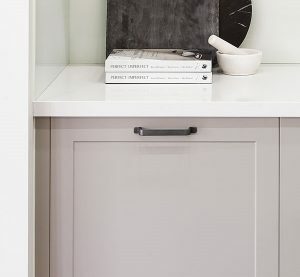 When starting a new project we are focussed on getting cabinets onto the design and some of the neater tricks to cabinet placement are missed. This can cause issues during installation or worse, design shortfalls which are obvious to all! However, with a few simple design rules to follow, you can avoid most of the common pitfalls which are expensive to rectify later down the track. Most kitchen designs will benefit from the use of Kitchen Filler Panels. 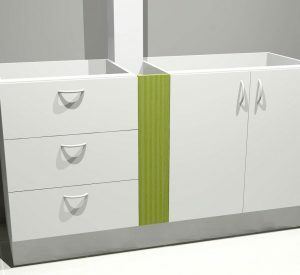 During installation, these will allow you to deal with various site obstacles including corner walls not being square, walls not being exactly vertical (resulting in cabinets either fitting tight, or not at all), allowing cabinets to open correctly regardless of handle choice (large handles can impede on walls if Filler Panels are not included). See, filler panels are useful for more than just filling a left over space. Even in this contemporary bathroom, a Filler Panel has been scribed next to the Towel Open Unit. 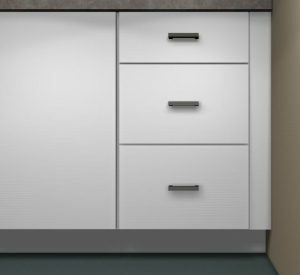 Filler Panels can also offer a more economical means of completing a design… Remember, it is always cheaper to use standard cabinets in your design rather than ask for custom solutions. If we can design cleverly with standard sizes; arrange and sequence cabinets to maximise the space, our budget will be benefit. Of course, this will often mean we have a unusable space left at the end of a run of cabinets. In this case the Filler Panel is a very cost-effective way to complete the space and allow benchtops and kickboards to run through to the wall. While some suppliers will simply provide generic panels that need to be cut down, look for options that provide purpose fillers for your design. While you will still expect some allowance to trim or scribe to fit on site, this will generally make a more complete solution if already colour edged on short sides, and supplied with fixing hardware. When your design calls for Filler Panels at both ends of a straight run of cabinet, it’s best to centre the cabinets on the wall, leaving equal sized gaps on either end of the run. You can then scribe each Filler Panel to fit the precise space. This will make sure your kitchen looks as symmetrical as possible! In any tight space, we will always try to squeeze as much functionality as we can into a single design. This often means the correct function of individual cabinets or appliances may overlap causing work flow issues when trying to use the kitchen. 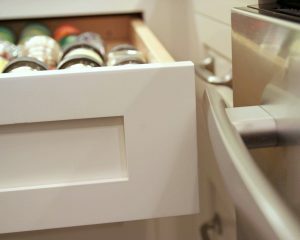 Often, large handles or large opening appliance doors, can protrude further into the kitchen space than is otherwise obvious. Don’t forget the cook also needs room to stand and work comfortably. A simple option is the Blind Corner cabinet – in either Floor or Tall Pantry version. Between cabinets with a column! 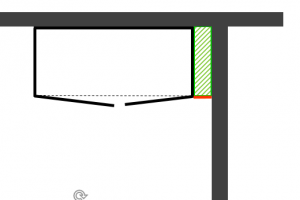 In some design scenarios, you may have come across a wall with a support column protruding into the available space. 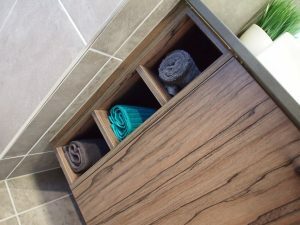 While some designs will look to have a custom cabinet cut around these to maximise storage, be careful in designing these with sufficient tolerance to fit any errors in measuring. Of course, any custom solution will cost you extra. In many cases, the simple inclusion of a filler panel will greatly simplify the installation process, and keep your budget on track. If you are faced with a tight budget and a tight timeline then you will want to think about any points of risk in your design. If you have a particularly wonky wall than allow more space with Kitchen Filler Panels to ensure your cabinets can remain true and vertical and you can deal with the wall on site quickly and neatly. This means spending time on the design to get these details thought through. It might also mean sharing your design with your other trades (electrician or plumber) to ask about any issues they may foresee? Be Smart in your design! With any new project, our motivation is high to finish the job and we all want to be in a position to enjoy the fruits of our work. Of course, most of us have a budget to keep in mind also. By designing tolerance and finishing details into our project from the start we can reduce risk and increase our chances of a successful installation. Of all the places to take shortcuts or make budget savings this is the last one! If you would like one of our professional Kitchen Designers to look over your design then please email us at sales@semble.com.au for a free design review. Simply tell us the Semble design reference number and we can mark up your design with any suggestions.